Eliminating the use of dangerous step ladders and other steps, this platform helps our client service the avionics on the fleet of Airbus A350s. 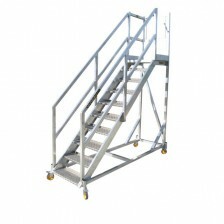 Sliding guardrails provide fall protection and several options for where to place the unit around the aircraft. 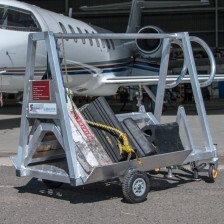 A perforated deck keeps the maintenance worker safe from slipping in wet or icy conditions, and step-through gates ensure a safe ascent to parts of the aircraft where overreaching is common. The 45-degree access stairs feel natural and balanced underfoot.